When Elvis Presley sung "Since my baby left me, I've found a new place to dwell, it's down (unh-huh) at the end of lonely street, at Heartbreak Hotel", he was uncannily prescient. We DO live in Heartbreak Hotel - and it IS located at the end of lonely street. We live in an ever-more-stressful age, where many of us are prey to anxiety, depression and countless (count 'em) neuroses. But so far there has been little or no research into how to make misery profitable. 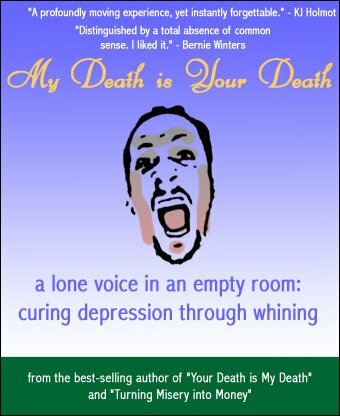 "My Death is Your Death" examines how depression affects emotions, behavior, relationships, and self, and discusses cost-effective and profitable ways of whining, griping and sighing. You are not alone. There are millions of suckers out there, waiting to be fleeced through your new-found ability to complain incessantly. Are you tired of spending your days at work moaning about how bad things are, only to pick up a meagre pay-cheque at the end of the month? Do you feel that your misery is wasted? My book will show you how you can make yourself feel better by making everyone else unhappy. And fast!